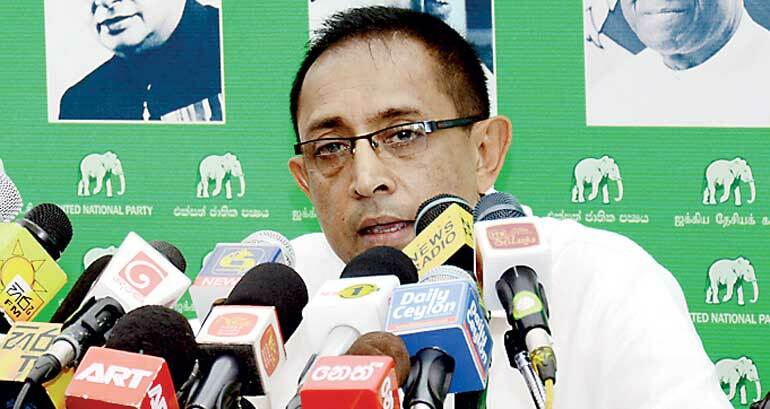 A confident United National Party (UNP) yesterday pledged to continue its battle to regain good governance in the country and warned its political opponents not to “rouse the elephant” in what is shaping up to be a close election battle. UNP General Secretary Kabir Hashim and stalwart Lakshman Kiriella kicking off the post-Rajapaksa announcement battle of words insisted the UNP together with its supporters would complete the battle begun with President Sirisena under the swan symbol in January. So far the UNP has received over 16,000 applications for nominations with extra resources needed to comb through the aspirants. Hashim noted that the second phase of ousting corruption, wastage and mismanagement would be successful under the leadership of the elephant and called on the public not to be swayed by the “tired old words” of the “Medamulana drama”.He went onto term former President Mahinda Rajapaksa’s return to politics as a “joke”. Hashim was also critical of the death of a UNP supporter in Ratnapura who is reported by election monitors to have been attacked during campaigning. This is the first death in a polls battle that is not even one week old, Hashim noted, calling on the Opposition to not use violence. “I have one thing to say to all these people. The elephant is a majestic beast but when it is roused it can cause much fear and damage. Do not rouse the elephant,” he said. The General Secretary also called on the public not to coalesce around parties that have been harbingers of massive corruption and extremism in the past few years and allow the progressive policies initiated during the last six months to grow and be taken forward under the leadership of UNP Leader Ranil Wickremesinghe. “Rajapaksa lost yesterday, he will lose tomorrow; that is the bitter truth,” emphasised Kiriella, taking his turn to speak to reporters. The former Leader of the House took the time to defend the track record of the UNP-led Government, particularly fielding questions over the Central Bank bond issue. He also dissed charges of losses to the country by insisting “numbers are greatly exaggerated,” and stressed Parliament had not been dissolved to shy away from tabling reports. “We supported the dissolution of Parliament because we could not move forward with crucial reforms. There was a bigger reason. We could not even pass crucial bills to increase Government revenue and pass on relief to the people. On the bond issue the Supreme Court case was thrown out. If there was even a shred of evidence, it would have been heard. We have not interfered in any of these processes,” he said. “People must pick the leader that suits the country. Our biggest need now is a leader who will grow the economy, create jobs and increase investment. This is something that only Ranil Wickremesinghe can do,” he added. Kiriella stressed the UNP was willing to partner with any moderate individual or party. “Even if former President Chandrika Kumaratunga joins us, we will give her nominations,” he quipped.